Today our way will lead back to the Old Town again. Walking through the old buildings around the corner of the streets Konviktská and Karoliny Světlé we will find the hidden Prague´s oldest Romanic rotunda. Let´s take a look over the walls of the Rotunda of the Holy Cross. As every interesting historical building, our rotunda has an interesting legend, too. 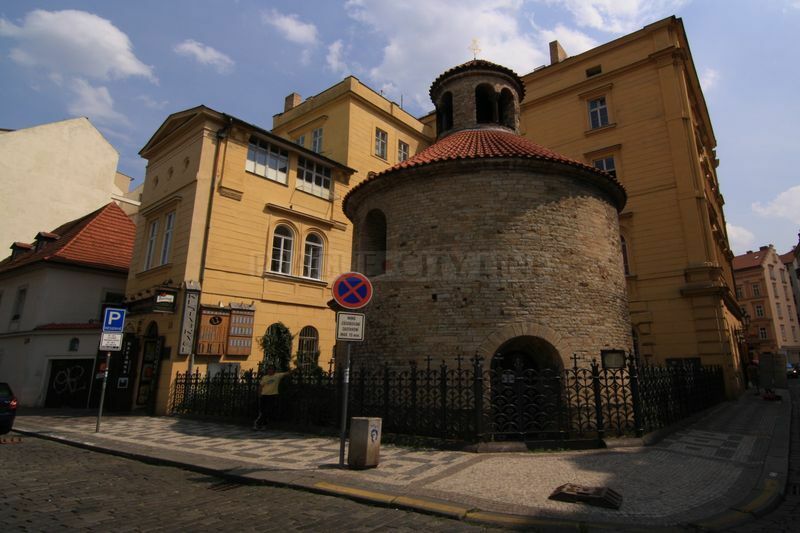 There used to be a lake in the past in the place of today´s rotunda where a crucified girl had been thrown. She was punished this way because she admitted the Christian faith against her parents´ will. There was a great storm in the night during which the cross came up to the surface. „A sign from God“ people said. However, during the reparations of the rotunda a big rotten cross was found in its foundations. 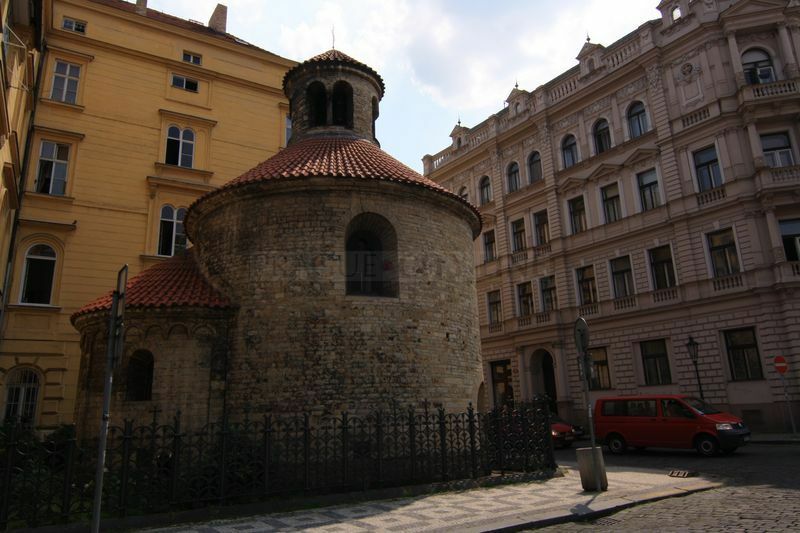 According to another legend there is supposed to be a basement with a huge treasure under the church which can be proved by a denarius of prince Jaromír originating in 1012 which was found close to the rotunda. 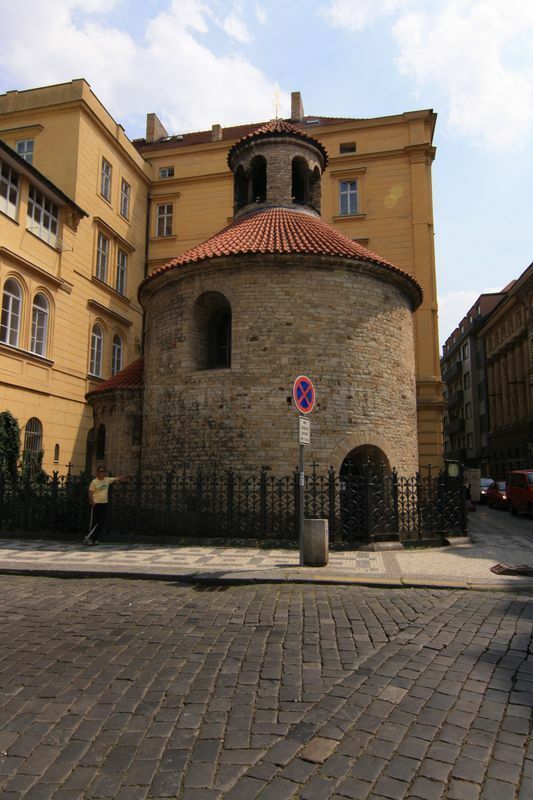 The rotunda was founded in the 11th century, therefore it is by right considered the oldest Prague´s Romanic rotunda. 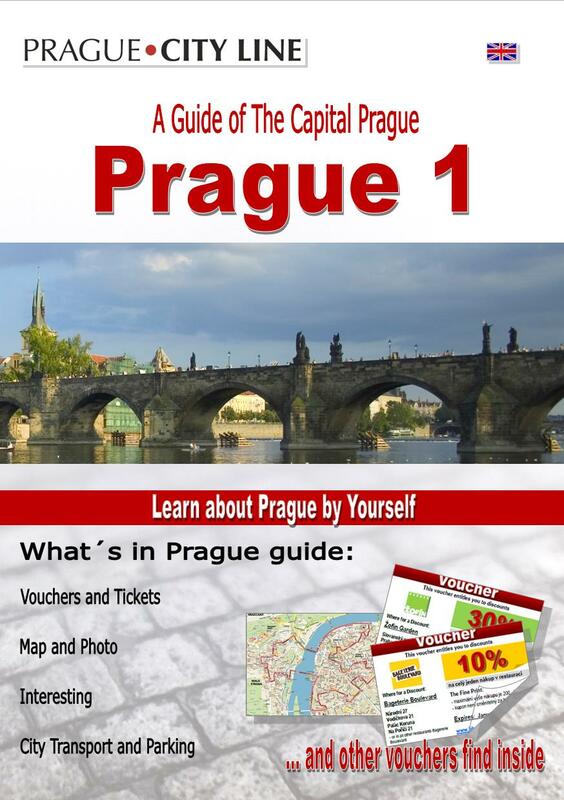 It was built on an important trade route which led from the Vyšehrad to the passages over the Vltava. Its visitors will be astonished by the circular body and semi-circular apsis decorated by a crimped frieze. Ceramic bottles with their necks turned into the inner space were bricked in the apsis and the body. This was meant to ensure much better acoustics. 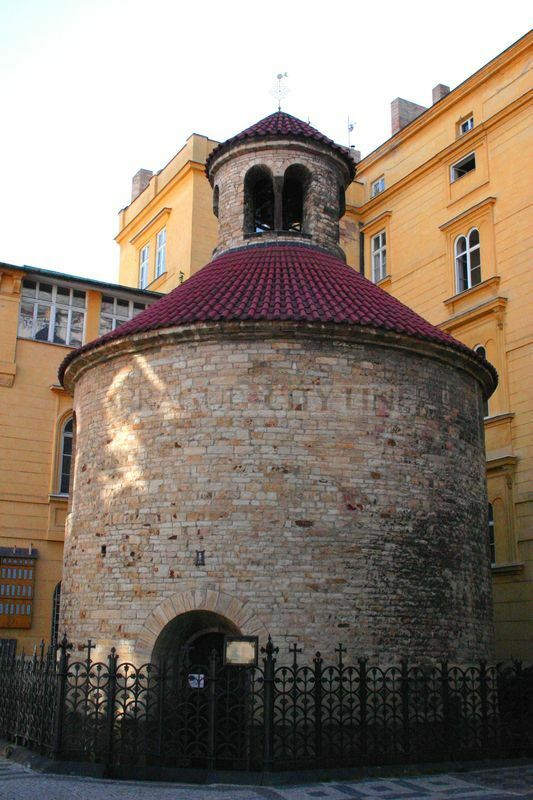 One of the reasons why it was built is that it was meant to be a private sanctuary of some of the lordly courts in the Old Town which was abolished in the Hussite period, and a churchyard used to be located nearby. And what is its name derived from? 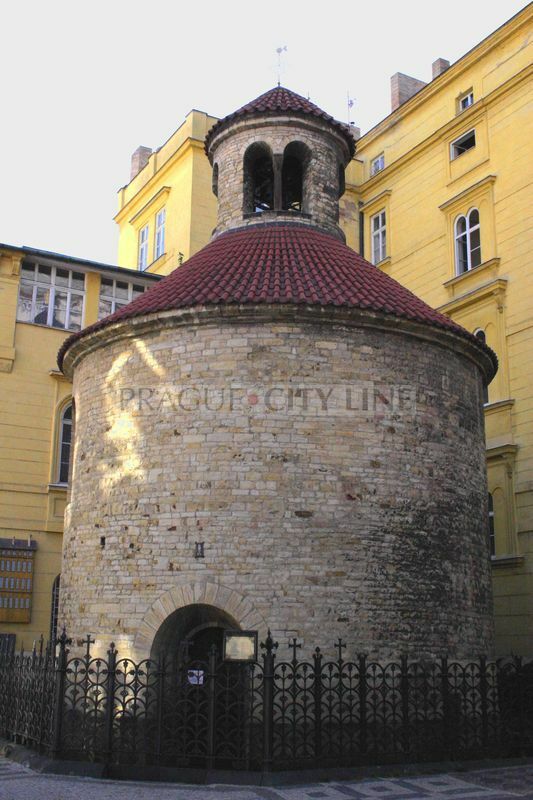 The rotunda is to be found in the supposed center of the urbanistic cross of the old Prague. The basic axis of the cross connects the St. Vitus Cathedral with the Rorunda of St. Longin by the Church of St. Stephen in the New Town. Across the line leads a connecting line of the Church of St. Clement in the Old Town and of already nonexistent Church of St. Philip and James located in the Arbes Square. And our rotunda is to be found in the center of these axes. The distance of the twosome churches is the identical and their sides form a cross with its arms measuring two thousand and four hundred metres. 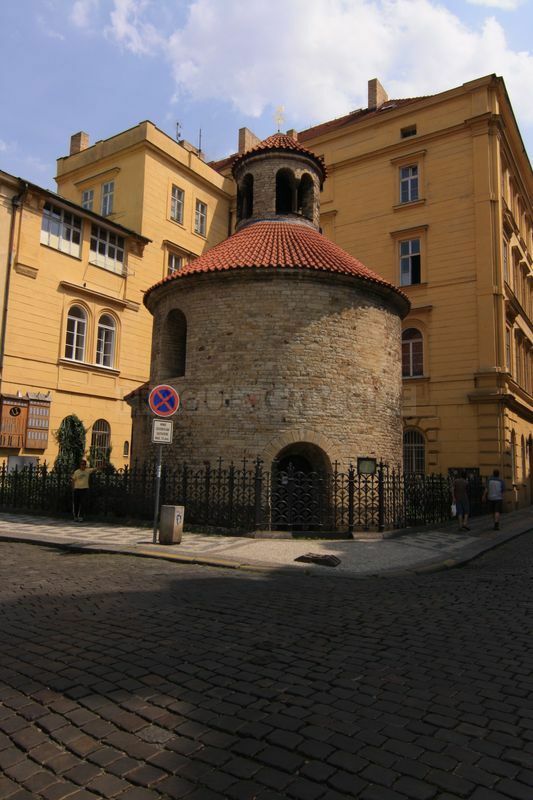 In the 17th century the rotunda even belonged to the Dominicans from St. Jiljí. Under the reign of the emperor Joseph II. the chapel was cancelled and turned into a charity store. The complete building gradually started to decay and it was even considered to be pulled down. Thanks to the ontime interference of the artistic forum the building regained its original appearance, the decayed bodies and elements were reconstructed and the redecoration of the interior was the credit of Josef Mánes, too. Nowadays, the rotunda is a parish church of the Old Catholic Church. Tram no: 17, 18, 53 – stop Národní divadlo dále to the street Divadelní and Konviktská. Tram no: 6, 9, 18, 22, 53, 57, 58, 59 – stop Národní divadlo to the street Divadelní and Konviktská. Rotunda of the Holy Cross (Rotunda sv. Kříže) 50.082839, 14.414728 Rotunda of the Holy Cross (Rotunda sv. Kříže) Today our way will lead back to the Old Town again. 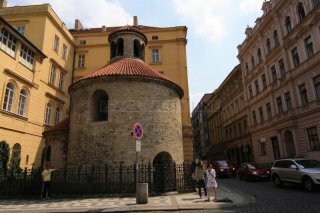 Walking through the old buildings around the corner of the streets Konviktská and Karoliny Světlé we will find the hidden Prague´s oldest Romanic rotunda. Let´s take a look over the walls of the Rotunda of the Holy Cross.